Apple Inc. (NASDAQ:AAPL) held its big Apple Special Event yesterday. The stars of the show were the iPhones, as we’ve come to expect from the September Apple event. 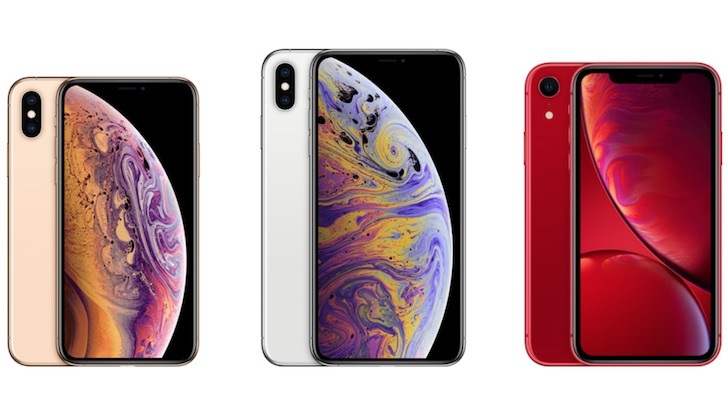 Three new models will be vying for your dollars over the next year: the iPhone XS, iPhone XS Plus and the iPhone XR. Apple also unveiled the Apple Watch Series 4 and gave a shout out to its forthcoming new operating systems, including iOS 12 and macOS Mojave. All in all, it was a decent event, although it was missing some hardware announcements we were expecting — including new AirPods wireless earbuds. Investors didn’t seem particularly enthused however. AAPL stock closed down 1.24% on the day, after getting a 2.5% goose the day before in anticipation of something incredible. As the releases have settled in, however, investors seem to be reacting positively. AAPL is up 1.21% from pre-Apple event levels as of this writing. We published our wrap of the Apple event right after it ended on Wednesday afternoon, but now it’s time for a more detailed look at what Apple announced. The iPhone XS is the followup to last year’s flagship iPhone X. 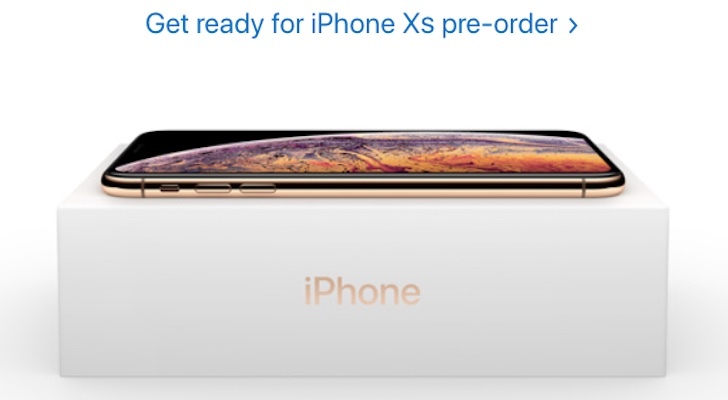 It looks virtually identical — other than the gold option that was added for 2018 — and the iPhone XS is being offered at the same starting price: $999. Of note are a new camera system (more on that later) and speed improvements courtesy of Apple’s latest mobile processor, the A12 Bionic. Apple also released a super-sized version of the iPhone XS called the iPhone XS Max. It boasts the largest display ever offered in an iPhone. 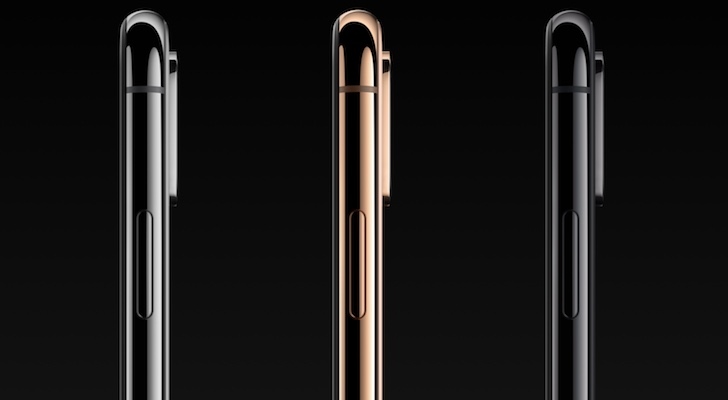 Aside from battery life, screen size and price, it’s identical to the smaller iPhone XS. Here are the specs that differ from the smaller flagship. The most interesting new smartphone Apple announced may well turn out to be the most affordable: the iPhone XR. This one mimics the look and functionality of the iPhone XS, but at a considerably lower price — $749. 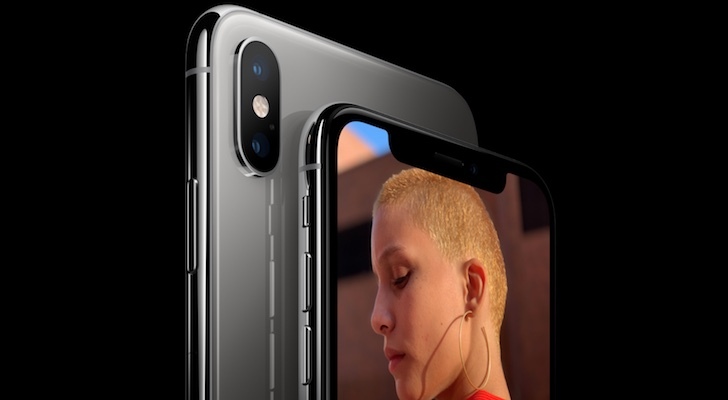 The iPhone XR offers a big display (larger than the iPhone XS) with a notch, minimal bezels, Face ID (and Animoji support) and the same A12 Bionic chip. This is the iPhone that could trigger the upgrade rush that lights a fire under AAPL stock. Why is it cheaper? It boils down to a single camera, no 3D Touch and less fancy materials: aluminum instead of stainless steel and an LED display instead of OLED. 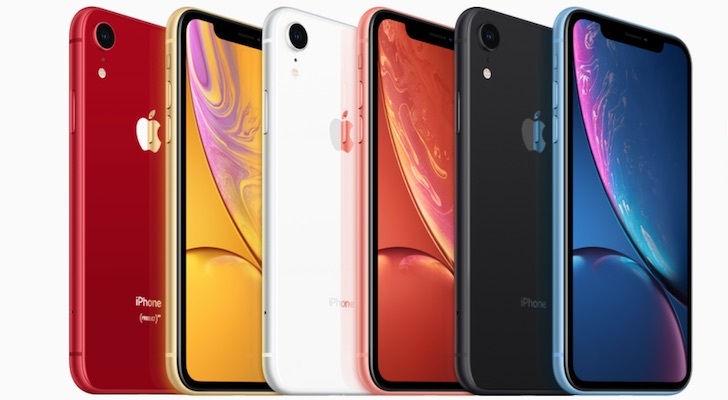 However, Apple makes the iPhone XR even more attractive to potential upgraders by offering it in a range of bright colors, a la the iPhone 5C. Camera performance is one of the key reasons for upgrading to a new smartphone and Apple has done some work with the 2018 iPhones that’s worth looking at in more detail. All three new iPhones are powered by the A12 Bionic processor, along with a much more powerful Neural Engine. This pays off with much faster image processing. The new iPhone cameras are also equipped with improved image sensors. This will mean a boosted AR experience, but the combination has a big payoff for photos as well. The new iPhones all offer what Apple is calling Smart HDR, a feature that leverages that computational power to splice multiple shots together more effectively than standard HDR. This approach is similar to what Alphabet’s (NASDAQ:GOOGL) Google division does with its stellar Pixel Phone camera. In addition, the new iPhones all get dynamic depth of field — including the single-camera iPhone XR. This lets users adjust focus and blur the background with a slider. Apple says you can also change the focus after the photo has been taken. 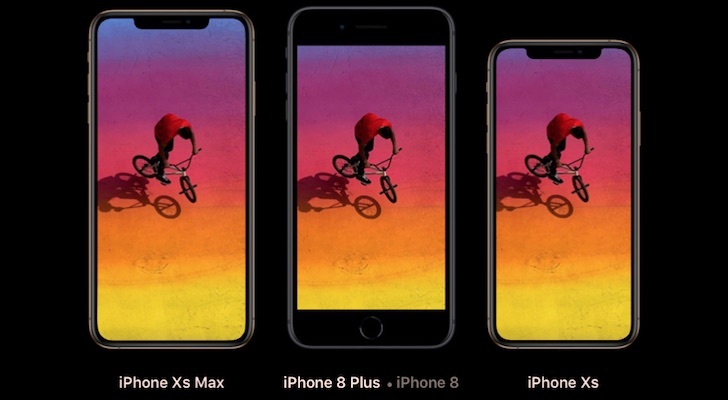 Although Apple didn’t talk about this specifically during the presentation, a number of old iPhone models disappeared from its website soon after. 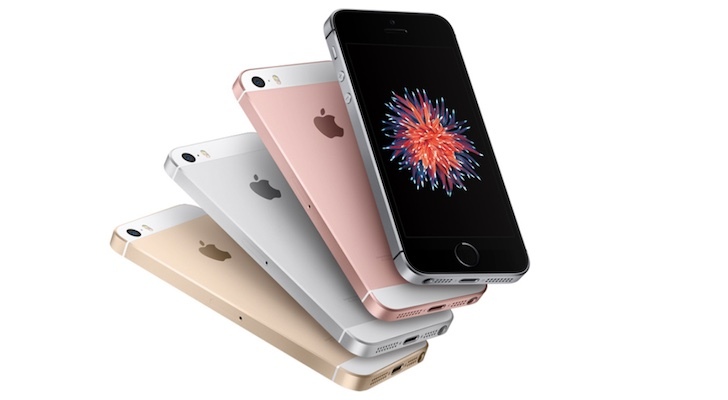 While there may still be some in retail channels and the company may still offer them in specific markets, Apple is no longer selling the iPhone X, iPhone SE or iPhone 6S on its U.S. website. That means the (now) $449 iPhone 7 is both the smallest and cheapest iPhone still being sold. And Apple no longer offers a model with a headphone jack. But the rumor mill had the new display being 15% larger, and Apple unveiled a new Apple Watch with a 30% larger display, and more pixels. The largest model is 44mm with a resolution of 368 x 44 pixels. Combined with a more powerful S4 processor, this means new watch faces with a lot more complications. The Digital Crown gets haptic feedback, the speaker is 50% louder (all the better to hear Siri or voice calls) and the microphone moves to a new location to reduce voice echo. The new Apple Watch also gets thinner, yet manages to keep the same 18-hour battery life of the Series 4. And it is compatible with all previously released Apple Watch bands. Apple and Fitbit (NYSE:FIT) have been sparring over fitness capabilities in their smartwatches, but Apple made some power moves in the health area with the Series 4. The Apple Watch Series 4 gets a second generation optical heart sensor, but also an electrical heart sensor. 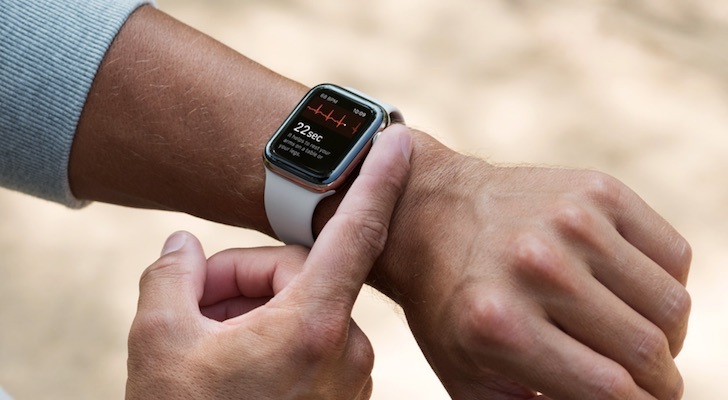 With an ECG app due later this fall, the Apple Watch Series 4 will offer the ability to generate an electrocardiogram (ECG) for detection of heart rhythm abnormalities. Apple says the feature has already cleared FDA approval. Also new for 2018 is fall detection. Injuries from falls are a serious concern with an aging population. The Apple Watch Series 4 can detect a fall, then automatically alert emergency contacts with a victim’s location if it determines they remained motionless after the fall. 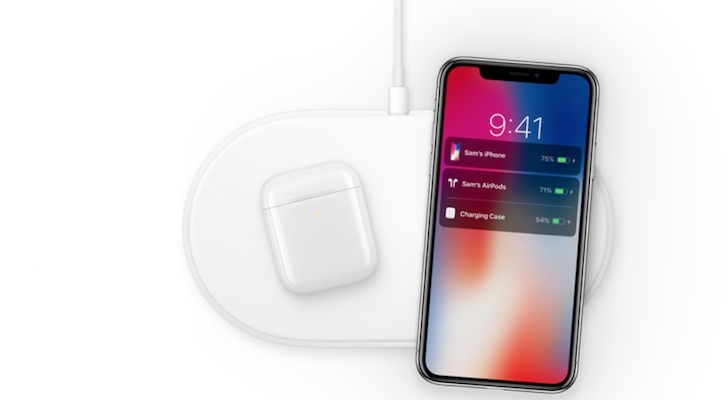 Also missing in action were AirPods 2 wireless earbuds, and a slew of gear we’re pretty certain Apple is working on, including a new iPad Pro with Face ID and replacements for the ancient MacBook Air and Mac Mini. Their absence raises the likelihood of another Apple event in October. When Can I Get My Hands on This Stuff and How Much Does it Cost? The iPhone XS and XS Plus start at $999 and $1099, respectively. Apple says you can pre-order them starting September 14, with delivery — and store availability — on September 21. There appears to have been a hiccup with the $749 iPhone XR, because its pre-order date is October 19, with delivery starting October 26. After the confusion of the staggered launch dates of the iPhone 8 and iPhone X last year, it seems unlikely Apple would intentionally do that again. 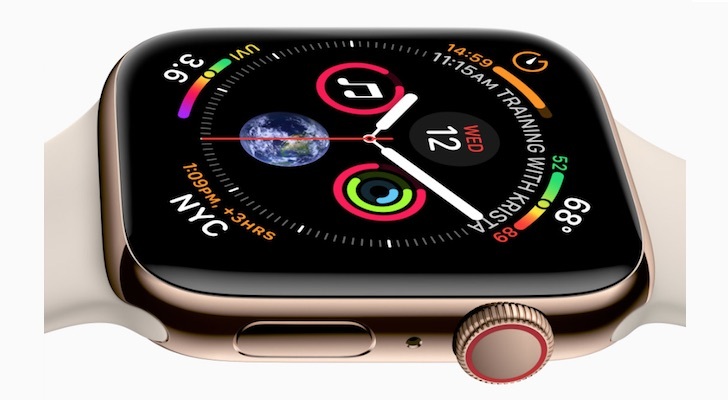 The Apple Watch Series 4 starts at $399 for the GPS version ($429 for the large 44mm size), while the LTE versions start at $499. Apple says preorders open this Friday (September 14) with shipping and in-store availability on September 21. Article printed from InvestorPlace Media, https://investorplace.com/2018/09/9-apple-event-announcements-an-in-depth-look-at-new-iphones-and-more/.